Today, Goldenvoice revealed its lineup for the Goldenvoice Presents April concert series. This year, the series will take over venues throughout Southern California with over 35 shows between April 10 and April 21 plus additonal shows later this year. 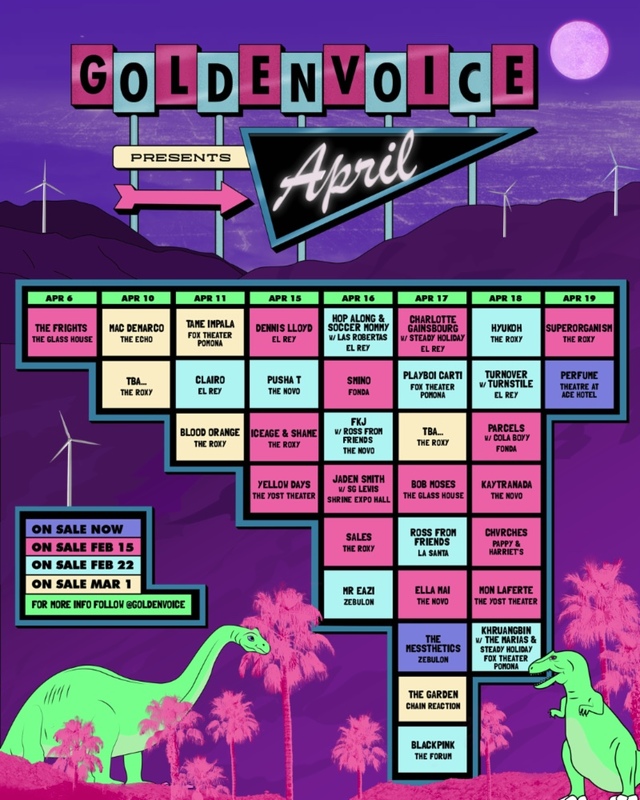 Goldenvoice Presents April, now in its sixth year, offers fans the unique opportunity to see their favorite artists in the most intimate settings in Los Angeles, Orange County, Santa Barbara, Pomona, Palm Springs and Indio. Tickets for these shows will go on sale over the course of three weeks starting this Friday, February 15 at 12:00 PM. Subsequent on sales will take place Friday, February 22 at 12:00 PM and Friday, March 1 at 12:00 PM. Tickets for all shows can be purchased here. See calendar above & visit AXS.com/GoldenvoicePresentsApril for more information and to browse the full list of shows and on sale dates. The following Goldenvoice Presents April shows are already on sale: Blood Orange and Christine and the Queens at Santa Barbara Bowl on April 18, ZEDD with Whethan and Yung Bae at Santa Barbara Bowl on April 19, Perfume at The Theatre at Ace Hotel on April 19 *sold out*, RÜFÜS DU SOL at Santa Barbara Bowl on April 20 *sold out* and The 1975 with Pale Waves and No Rome at Santa Barbara Bowl on April 21. Wallows, performing on May 23 at the Fonda Theatre, Mac DeMarco, performing September 13 at The Greek Theatre and K-pop phenomenon BLACKPINK at not-so-intimate Fabulous Forum on April 17 (on sale February 20 at 4:00 PM) are also part of Goldenvoice Presents April. Participating venues include: The Roxy Theatre, El Rey Theatre, Fonda Theatre, The Theatre at Ace Hotel, The Novo, Shrine Expo Hall, The Glass House, The Greek Theatre, The Forum, The Echo, Fox Theater Pomona, Santa Barbara Bowl, Chain Reaction, Pappy & Harriet’s, Zebulon, Marty’s On Newport and The Yost Theater. Postmates is the exclusive food partner for Goldenvoice Presents April. Customers can enter “GVPRESENTSAPRIL” as the promo code on any Postmates order placed from February 13th to February 20th to be entered to win the ”golden ticket” prize: A ticket for the winner and a +1 to all showcases. Some exclusions may apply. The ‘golden ticket’ winner will be announced on February 21st. For a chance to win 2 tickets to a specific Goldenvoice Presents April show, customers can enter the artist’s name as the promo code in any Postmates order until 2 days before the show. Follow @postmates to find out which shows Postmates will deliver free Sweetfin poke bowls to. Full details.